Rosiclare Community Consolidated High School "Bears"
Rosiclare (population 1,213) is located in far southern Illinois on the banks of the Ohio River. According to http://www.hardincountyil.org/history.org/history.htm the town was first settled in 1807 and was originally called Ford's Ferry. 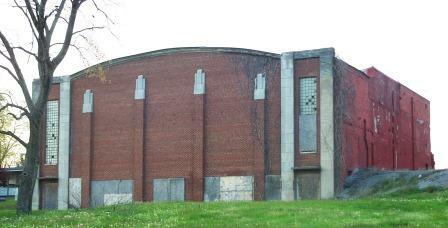 It is situated in the southwest area of Hardin County. It soon became clear that the area was abundant in lead. Flourite mining helped the town to grow rapidly. The name of the town changed to Rose Clare and was named in honor of two young daughters of early settlers. Over the course of a few years the name simply became Rosiclare. 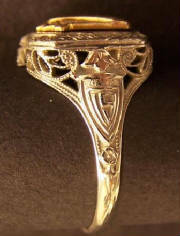 It was incorporated as a village in 1874. Rosiclare's population peaked at about 2,000 residents during World War II because of the need to mine its lead and other valuable minerals. Rosiclare once boasted of having Illinois' biggest Flouspar mining operation, however the mine ceased its operations in 1996. Rosiclare is the home of the American Flourite Museum. Illinois Route 34 begins in Rosiclare and travels north, connecting it to Illinois Route 146. The Illinois Central Gulf Railroad built a line that goes directly to Rosiclare and ends there, probably to assist in transporting the mining products. There is a lake on the northwest side of town and two unnamed creeks that flow through town. A town of note for location purposes would be Carbondale located 50 miles northwest of Rosiclare. The history of Rosiclare's educational past is very well documented on a website that was brought to our attention by Claude and Becky (Curtis) Brandt. 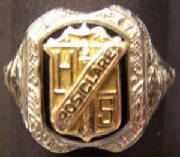 The website is dedicated to the memory of Rosiclare Community High School and can be viewed at www.rosiclare.com. The site's webmaster, Charles "Chuck" Ashford, has done an excellent job in capturing the sentimental part of losing one's high school in the name of "progress". 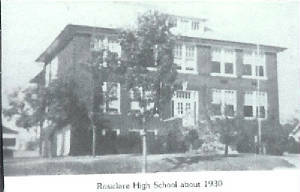 According to www.rosiclare.com, Rosiclare High School was established in 1918 with the first freshman class beginning that fall. By 1920 the school was an accredited 4-year high school. 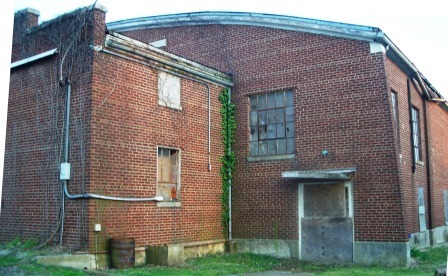 A gymnasium was first added in 1927 and a newer gym added in 1947. The Rosiclare Community High School "Bears" represented the school and town very proudly for over 50 years. It was in the mid-1970s that talks began to arise regarding the consolidation of the Hardin County High Schools located in Rosiclare, Elizabethtown, and Cave-In-Rock. These towns and their school districts agreed to consolidate their educational efforts. The Hardin County School District was formed in 1977. Rosiclare High School building housed the Hardin County High School through the 1979-80 school year. In the summer of 1980 all grades were located to a new school built near Elizabethtown. The fate of the original Rosiclare school building is a sad but all to common one. The building was razed except for the gymnasium. The gym is now used as a garage for a private business. Rosiclare High School offered boys basketball and girls softball for sure. These sports won hardware in IHSA tournaments. We believe that the boys also competed in baseball and track and the girls possibly basketball, volleyball, and track. 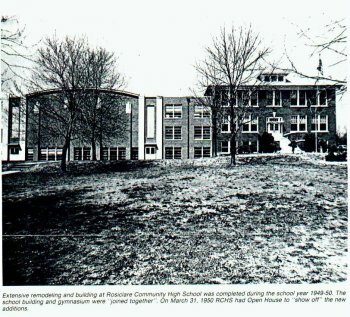 Rosiclare High School was a member of the Greater Egyptian Conference along with Shawneetown, Equality, Ridgeway, and Golconda. School fight song and any other items regarding the athletic program at Rosiclare High are welcome. The Rosiclare boys won two DIstrict titles in back to back seasons. The years were 1933-34 and 1934-35. Unfortunately the team records and coach's names of these and other great Rosiclare teams are not available. Some basketball scores were located on a website titled "Illinois Postseason Basketball Scores." These scores are listed below. ROSICLARE (61): Turlay 26, Carr 15, Phillips 8, Weathrington 6, Winchester 5, Steward 1. VIENNA (60): Crews 19, Racey 17, Turner 14, Miles 6, Dameron 4. ROSICLARE (70): Miller 22, Stunson 18, Spivey 9, Drumm 9, Stone 8, Anderson 2, Logan 2. The Rosiclare High School girls softball program won the school's only Regional title. The team of 1976-77 brought this honor home to Rosiclare. Unfortunately the team record and coach's name of this group is also not available. "I attended Rosiclare High School until 1979. We were consolidated with Cave-In-Rock High School in 1977, as you stated in your website, but we were not located in Elizabethtown until the school year 1980-1981. My brother was the first graduating class from the new building that year. I was the next class year." 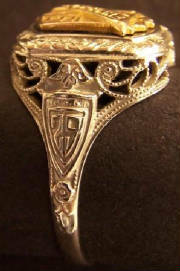 "I just wanted to share that I just had my grandmother Frances Rightmire's class ring from Rosiclare (1929) resized so I could wear it, and looked up the history on the net and found your page. It was interesting to read about the town and the high school!"